Sculpture in Tropical Australia is Alive and Well! Sculpture in tropical Australia was alive and well I concluded, as I wandered along Four Mile Beach early one morning. Oblivious to the throngs of joggers, bike riders and sandcastle-building children, an artist was hard at work building lively driftwood sculptures. With great energy and concentration he scooped holes, dragged dead tree trunks and branches to an area, where he began to assemble the most wonderful, lively “people”. Characters emerged, reclining, beer in hand, children played, lovers walked, arms entwined. Fallen coconuts conveniently provided heads for these beach sculptures, but there was nothing “kitch” about them. Eventually I could contain my curiosity no longer so interrupted Tony to ask about this amazing activity. “Yes”, he replied, “I make my sculptures most years after the storms and high tides bring in the driftwood. Then the tide comes in and washes them away. But that’s OK, too”. This refreshing attitude and welcoming of impermanence is usually not associated with sculpture. With the exception of “environmental sculptures”, sculpture in tropical Australia is more likely to be constructed from clay, timber, stone and even local marble…and meant to last forever! However a newcomer to Port Douglas (in 2012) is sculptor, Ross Bannister , who specialises in making sand sculptures, either on the beach or for special events. Leading sculptors in the Cairns/Port Douglas area include Ben Trupperbaumer, who uses recycled timber in his huge public statements about the influence of man on the Australian landscape. Bronze and timber are used separately or in combination for those which seek to tell of the essence of nature on a more domestic scale. Judy Richards’ figurative sculptures in clay or bronze capture moments of narrative, while Ellen Terrell carves delicate porcelain or collages simple clay forms with elements of her familiar tropical environment. Raw looking but beautifully balanced ceramic forms by Aboriginal elder, Thancoupie, sadly now deceased, reflect indigenous culture of the region. Then there's Peter 'Potter' Thompson, renowned for his beautiful, meticulously crafted ceramics. Lone White references Asian influences in strong ceramic forms, Ridley Buttrose manipulates heavy rope, while Jennie Scott delights with her driftwood sculptures of wild horses made from small pieces of weathered twigs, patiently assembled into fluid, life-like motion. 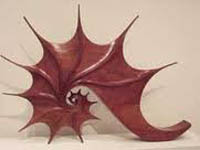 One cannot consider sculpture in tropical Australia without noting the integrity, thought and inspiration behind work being undertaken by Jill Chism. Well respected painter, teacher, photographer and installation artist, Jill’s passion for and interest in the mysteries of natural phenomena are expressed most recently in her ephemeral environmental sculptures. Sculpture is an artform which lends itself to artworks associated with public buildings and spaces, where artists are able to work on a large scale, devising site specific works to enrich peoples lives. But have you, I wonder, heard of digital sculpture , whereby the artist can scan and make sculptures from computer models? Amazing!